China's major industrial firms saw stronger profit growth in the first 10 months of this year, the National Bureau of Statistics (NBS) said Monday. 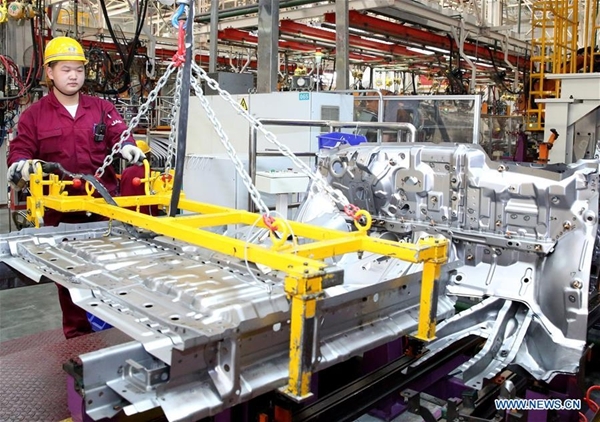 Industrial companies with annual revenue of more than 20 million yuan (about 3.03 million U.S. dollars) reported profits of 6.25 trillion yuan in the first 10 months, a 23.3-percent increase from one year earlier, the NBS said in a statement. The growth marks a strong pick up from 22.8 percent in the first three quarters. In October alone, profits of major industrial firms rose 25.1 percent year on year, slowing down from 27.7 percent in September. Among the 41 industries surveyed, 38 posted year-on-year profit growth during the first 10 months. High-tech manufacturing and strategic emerging industrial enterprises reported faster growth during the ten-month period. The high-end equipment manufacturing and new material sectors saw profits up 29.3 percent and 29 percent, respectively, said the NBS. Meanwhile, industries like coal, steel, chemicals and petroleum also recorded strong performance. In the Jan.-Oct. period, combined new profit in the sectors of coal mining and washing, ferrous metal smelting and rolling, chemical raw materials and chemical products manufacturing, as well as oil and natural gas exploitation accounted for 51.2 percent of the total profit increase. "While industrial profits maintained a relatively fast growth, improvements were made in enterprise efficiency and profitability," NBS statistician He Ping said. In the first 10 months, costs per 100 yuan of revenue dropped 0.26 yuan from the same period last year, while expenses per 100 yuan of revenue went down 0.25 yuan, according to He. He mentioned that the leverage ratio at Chinese industrial enterprises, a measure of financial risks, also went down amid the government's ongoing deleveraging efforts. By the end of October, their debt-asset ratio dropped 0.5 percentage points from a year ago to 55.7 percent. China's major industrial firms saw stronger profit growth in the first 10 months of this year, the National Bureau of Statistics said Monday.